"...he is not a beast of flesh and blood." 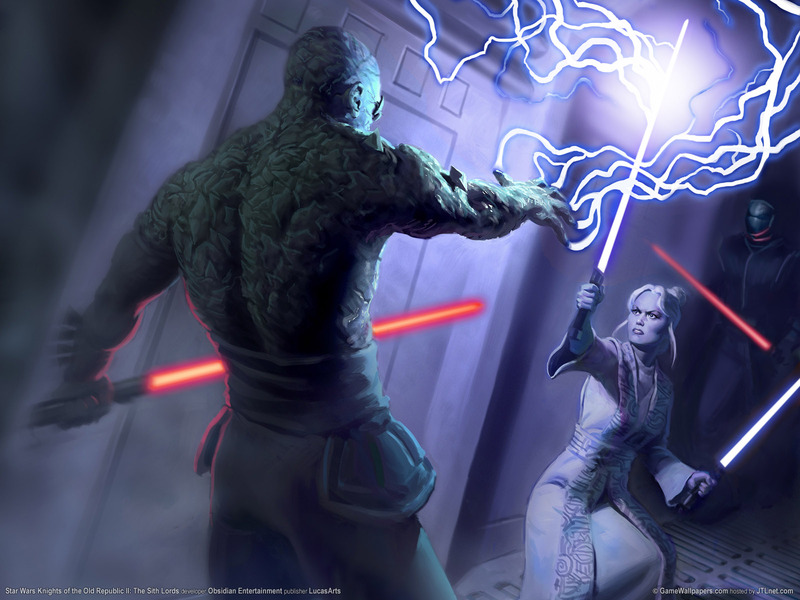 Surviving the Sith backstabbing following the Jedi Civil War, Sion's abilities draw the eye of Revan's former master, the powerful Darth Traya. Three lords stood above all others: Darth Nihilus, whose hunger devoured all life around him; Darth Sion, whose shattered body was held together by hatred; and Darth Traya, once a Jedi Master but now the Lord of Betrayal. You don't have to fight for long, however, before receiving a telepathic message from Kreia. She warns that at your current strength, Darth Sion is unbeatable; your only hope is to flee. "He cannot be defeated... he is not a beast of flesh and blood. This is not a battle that can be won. Flee." "Their leader, Darth Sion, is a perversion of the Dark Side such as I have not seen before." Only by fighting your way through the Sith's strongest guardians can you earn the right to confront your nemesis. At last, you have defeated your most powerful enemies and can finally rest and take comfort in the fact that the Force itself is safe from Kreia and the Sith (for now). Amazingly dark and devastating powers are the purview of some of the greatest Sith Lords of the Knights of the Old Republic era. Average beings stand no chance of stopping these ultra-powerful monsters of the dark side. As a marauder for the Sith Empire during the Great Sith War, Sion flings himself at the Jedi, seeking death, but instead, he finds the opposite. Regularly surviving the frontline pandemonium, Sion acquires a pain tolerance that convinces him of his immortality. Inevitably, probability has its day and Sion is struck down. Yet death does not come for Darth Sion, and each centimeter of his failing body comes alive with anguish, multiplying that infinitely distant point of pain one thousandfold until his brain threatens to collapse. Improbably, Sion gets up. And as he locks eyes with his attacker, Sion lets all of his anger for being killed - all the hatred clotting his heart - explode. Sion finds that keeping his decomposing flesh tethered together with dark side energy is inexplicably painful, and requires endless concentration on the rage that festers inside him - but immortality is immortality. Sion embarks on a Jedi-assassination spree,"dying" many more times, but always ending more enemy lives. "Checking the survivor from the Sith vessel - I'm not sure whether he's alive or dead, or what's even keeping him together. His flesh is cracked and scarred, and I'm registering several thousand fractures in his skeleton, as if each bone was repeatedly splintered over time... then put back together. Judging from the scar tissue, I believe these wounds took place before his death. If so, he must have been in constant pain. I have no idea what's been keeping him together." "The power of the dark side is what holds me together. Many times have I been near death - and always have I been in pain. " "Now you realize the true power of the dark side. As long as the dark places of this world flow through the cracks of my flesh, I cannot be killed." "I can die a hundred times, exile, and still I will rise again, as strong as before." Perhaps the most rage-filled Sith Lord yet encountered, Darth Sion is a shattered mesh of flesh and bone. Sion is in constant pain, but his body is held together by will and fury. He is a true, immortal manifestation of the Dark Side of the Force. Few Sith Lords hold mastery over pain or hatred like Darth Sion, Lord of Pain. His visage is terrible to behold: a decomposing body held together by dark side energies channeled by Sion himself, sustaining his life through the Force, powered by anger and hatred. He is in eternal pain but endures it as a small price for apparent immortality. Darth Sion's body had been torn apart and knitted back together into a patchwork of mutilated flesh. This left him in eternal pain, his broken body held together only by his hatred and the power of the dark side. Darth Sion, whose shattered body was held together by hatred. Darth Sion, the Lord of Pain, is the apprentice to Darth Traya. His body parts are held together by sheer will and hatred. A feared Lightsaber Assassin, Sion's chaotic wrath is directed towards Sith and Jedi alike as one of the titular villains in Knights of the Old Republic II: The Sith Lords (PC and Xbox, 2004). As a Marauder for the Sith Empire during the Great Sith War, Sion flings himself at the Jedi, seeking death, but instead, he finds the opposite. Regularly surviving the frontline pandemonium, Sion acquires a pain tolerance that convinces him of his immortality. The many wars of the era compel large numbers of Jedi to become experts in lightsaber and force related combat. Some become masters on the battlefield; others become highly skilled duelists capable of taking on Dark Jedi and Sith in single combat. The Sith students of Darth Revan and Darth Malak are many of the same Jedi Crusaders that once fought for the republic. Already proficient in the Jedi arts, these marauders acquire new nefarious talents studying at the feet of Headmaster Jorak Uln - one of Exar Kun's original Sith acolytes. During the Dark Wars, surviving Sith students submit to the triumvirate. Meanwhile, Sith survivors wage civil war, culling the weak and electing leadership by the lightsaber's blade. Darth Sion created an elite cadre of Sith assassins, eroding the already-weakened Jedi from the shadows, while Darth Nihilus began roaming the galaxy, seeking the life energy of Force users to satisfy his insatiable hunger. Sion led a sect of Sith assassins sent to wipe out the Jedi Order. Kreia took the name Darth Traya, and her followers called themselves the Sith after the long-lost species that had invaded the Republic a millennium before. They began a systemic purge of the galaxy, hunting down those who still held fast to the Jedi Code, killing them by the tens of thousands. Sion embarks on a Jedi-assassination spree, "dying" many more times, but always ending more enemy lives. Darth Sion has vanquished many Jedi foes. Even more so than in the Clone Wars, these are the days of the Jedi in their prime. They do battle with the evil Sith, and defend the galaxy against the Mandalorian hordes. Established by Darth Revan and heavily utilized by Darth Sion, these surreptitious butchers specialize in practical modes of Jedi execution. They drain the Force from their targets to augment their own powers and expertly turn captives into Sith with a combination of torture, Sith poisons, and the dark-side-drenched masks they wear. The most elite of these assassins are the Bladeborn - Sith blademasters who sometimes use lightsabers but more often wield dreaded tremor swords. Secluded on Malachor V, the Sith Assassins become pivotal tools for the Sith Triumvirate. Traced to the Bladeborn, a Sith offshoot dedicated to sword mastery, these cortosis-faced weapons were given to “masterblades” who survived no less than 10 lightsaber-wielding warriors in combat. You board the ship to find the entire crew slain—with mysteriously little sign of battle. The cause soon appears as Sith assassins uncloak for the fight. "Now it ends. And the darkness comes." Sion was exceedingly difficult to kill, because his mastery over his own body lent him supernatural vitality. "To walk on its surface is to feel it crushing every cell of your being. It is like being buried alive until it feels like you may never breathe again..."
"We were trying to imagine how you would have some guy who was literally telekinetically holding himself together," says Avellone. Alter Environment allows a Force user to manipulate nature and the environment around them, allowing the creation of varying natural phenomena. Because of Sion's presence, this area is eerily quiet; you don't have to worry about Sith ambushes. Hibernation Trance, Healing Trance or Force Trance allows a Force user to slow down bodily processes and make himself appear dead. Darth Sion heals at will, but you can win by striking him down repeatedly. The Lord of Pain can restore his health at will; you have no choice but to flee him for now. He can fully restore his vitality at will. Force Lightning is a Force power which allows a dark sider to unleash electrical discharges from their fingertips, acting much like normal electricity but also having the property of weakening life. Force Drain is a dark side power in which a Force user can Drain the life force or Force powers of another being. "I was cast down... stripped of my power... exiled. I suffered... indignities... and fell into darkness." "But Traya underestimates her disciples' depravity. They turn on her and drain her Force powers." "The sect of assassins that chase you feed on the Force... Those Sith assassins can sense their prey through the Force—it is like a hunger. They feed, and grow stronger, when they are near Force Sensitives. The stronger their prey is in the Force, the deadlier they become." The shattered Dark Jedi attacks you with a lightsaber and Drain Life; improve your chances the moment battle begins by protecting yourself with Energy Resistance or a powerful shield item. Force Sense is a basic, passive power which acts as something of a sixth sense for a Force user, allowing them to feel and detect varying things. "I sense you, my master. Faint... Weak."